This is the most thorough concealed carry training course in the Triangle. 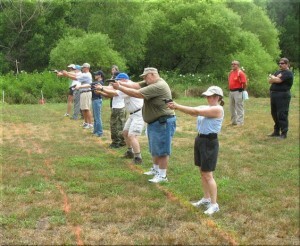 FTA offers two options for class: Option One is comprised of two, four-hour classroom sessions on weekday evenings – one covering NC law pertaining to concealed carry and the use of deadly force and the second on firearm safety and fundamentals of concealed carry – and concludes with one four-hour live-fire, range qualification on our private range on the following Saturday. Option Two is comprised of one eight-hour class classroom session on a Saturday covering all classroom requirements followed the next Saturday with the four-hour live fire qualification. Weekday evening classes are held at Heather Hills Club in Garner, NC and the Saturday classroom sessions are held at Cabela’s in Garner. Safety is our first concern! All our students learn safe handling of the firearm before qualifying on the range. No matter what type of firearm you have we can teach you how to use it safely. The course is fully approved and meets all requirements to apply for a Concealed Carry Handgun Permit anywhere in North Carolina. Enacted in 2004, The Law Enforcement Officer Safety Act allows the “qualified law enforcement officer” and the “qualified, retired law enforcement officer” to carry a firearm in any jurisdiction in the United States, regardless of state or local law to the contrary, with certain exceptions. ADVANCED FIREARMS TRAINING – NEW COURSE!! This day-long course will reach beyond the fundamentals of shooting a handgun and teach students how to improve their defensive skills with a firearm. We will incorporate various dry-fire and live-fire drills that will take a student past merely punching holes in a target. Each student will practice drawing techniques, malfunction drills and shooting from various positions. Each student will learn to engage multiple targets and run through our combat shooting course capped off with a final qualification test. This is an intense, practical course recommended for anyone who is serious about improving their pistolcraft! 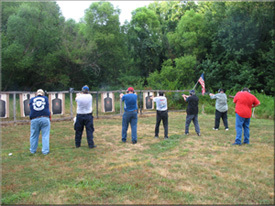 Our 3 to 1 student to instructor ratio emphasizes a profound commitment to shooter safety. Because of the dynamic nature of this course, class size is limited so don’t miss out. Step 1 – Send an email to ftawegs@mindspring.com with your selection of class date. We will handled all requests in the order they are received. Step 2 – FTA will send you an email reply indicating that you have a tentative spot in one of the classes pending full payment and you will then be instructed to go to our website and pay via PayPal. Step 3 – Once FTA has received your payment you will receive an official confirmation email with directions to class and detailed instructions. Please note, because of high demand and small class size, once registration and payment are confirmed there will be NO REFUNDS. FTA, Inc. also offers advanced training courses for Shotguns, Rifles & Handguns, Classes for Women Only, Tactical Rifle Training and use of Force and Legal Issues Program. Private and group classes are available on request and special rates apply. All course study materials will be furnished. Student should provide his/her own firearm, ammunition, hearing and vision protection. Our classes are held at various locations throughout the Triangle depending on class size and demand. 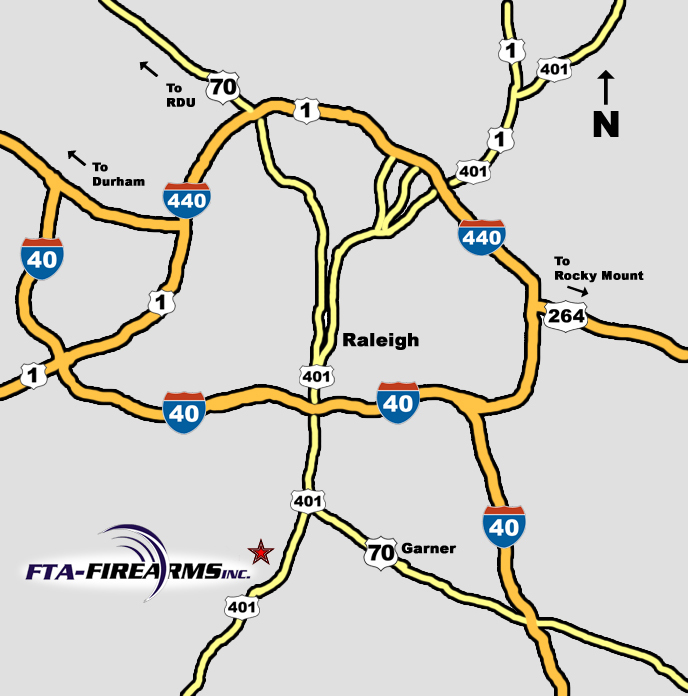 Our private firing range is located 5 miles Southwest of the Raleigh Beltline.